The fifteenth issue of Motor Stories has just been released to Project Gutenberg thanks to the work of Distributed Proofreaders volunteers using images from our Digital Library. Motor Matt’s Submarine; or, The Strange Cruise of the Grampus takes the series in a new direction, focusing on adventures at sea since Motor Matt’s air ship was destroyed in the previous adventure. As usual, there is plenty of action, with Matt and his friends facing such threats as sudden squalls and sea battles. As usual for the series, there is also a filler story unrelated to the main adventure; in this case, it’s “The Chicken-hearted Tenderfoot,” a brief Western adventure which may have been reprinted from the British story paper Chums, though it is possible that this is an entirely different story that happens to share its title with the British tale. 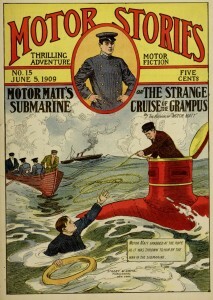 The entire issue can be read online or downloaded in eBook format through Project Gutenberg.